At Mas “LA TRAMPA” information is available on the best walking and mountain bike routes around the area. The farmhouse has its own ecological vegetable garden in which guests can wander around or if you like help with the daily tasks of maintenance. Private parking area and kennels for the comfort of your dog. Apart from visiting the village itself the surrounding area offers many attractions to fill your days. Excursions range from ecological nature routes to the varied selection of bars and restaurants on the coast. - Nature reserve in the mountains of Prades. - Theme Park Universal Mediteranea (Port Aventura). - Tour of the Roman City of Tarragona. - Climbing in the mountains of “La Riba” , “La Mussara” one of the most important -areas for climbing in Europe. - Medieval walled village of Montblanc. 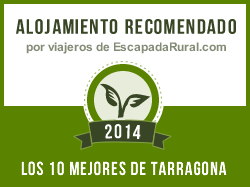 - Route of the vineyards and villages of the wines of Priorat and Tierra Alta. Our village has a big Spa designed for relaxation for your body. Heated pool, cold pool, Finnish sauna, different types of shower, large Jacuzzi aviable.You can buy tickets directly from our hotel.